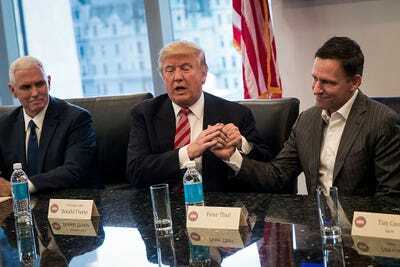 On Thursday, influential tech mogul Peter Thiel predicted that President Trump will win the 2020 election if he decides to run for office. PayPal cofounder and billionaire venture capitalist Peter Thiel was one of President Donald Trump’s biggest Silicon Valley backers during the 2016 election. Now, he’s predicting a second term for Trump – should he decide to run. Trump has already begun staffing up his reelection campaign for the 2020 election. Thiel’s remarks came during a fireside chat at the Economic Club of New York on Thursday, moderated by Fox Business Network anchor Maria Bartiromo. While Thiel’s support for Trump has divided employees and leadership at some Silicon Valley’s most influential companies, Thiel said that his libertarian political leanings should come as a surprise to no one.